Everything happens for a reason. What is that reason? Big Tommy teaches us this: That everything is going to happen, so it does...You should not question it. 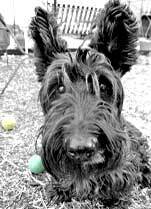 When we first sought out Ajax we told our friend Cheryl that we wanted a big headed, big eared boy and asked her if she knew of any scottie rescues fitting this description. 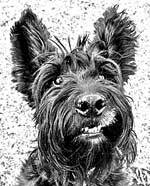 The only available dog was the sleek, beautiful, well proportioned Ajax. Of course we fell in love with Ajax. We were meant to have him. That simple. But, the search went on unbeknownst to us. 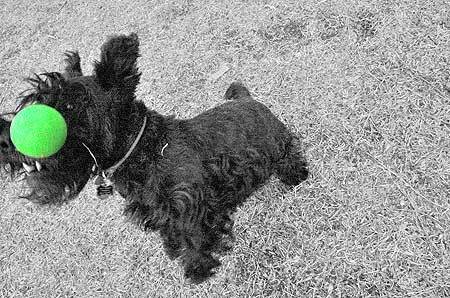 Soon after Ajax came to live with us Cheryl called us on the way home from the far flung rescue of the biggest eared, biggest headed bruiser of a scottie boy she had seen in a long time. She was so excited she couldn't even get him home before bringing him by our house. Tommy was 5. He was an owner release by a young mother with two small children. 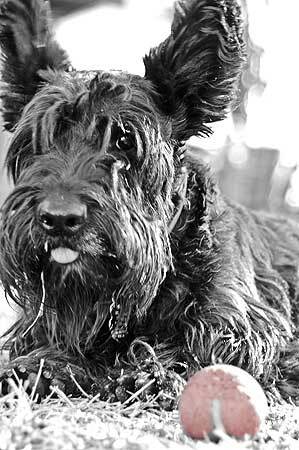 Tommy could not have come to us before Ajax. Nessie needed Ajax first. 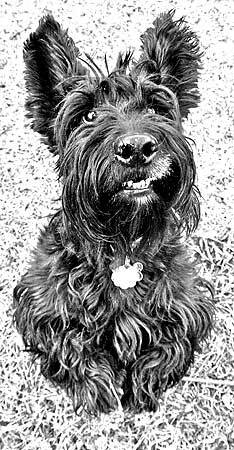 Tommy's name was immediately changed to Big Tommy because "Tommy" was not enough (but it was a good start). 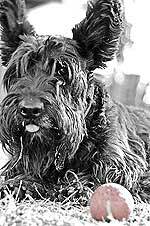 We soon discovered Big Tommy's passion for his green rubber ball. We thought it was a security blanket at first. Then we thought he was mentally ill and a bit obsessed with "Precious". But now we know it is his key to enlightenment. It matters little if the ball is green or if it is red. Only that it is. 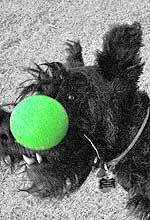 Tommy's newest trick ... he learned by watching me do it (honest), ... is to balance the ball on his nose and catch it in his mouth. Ok then, you try it. 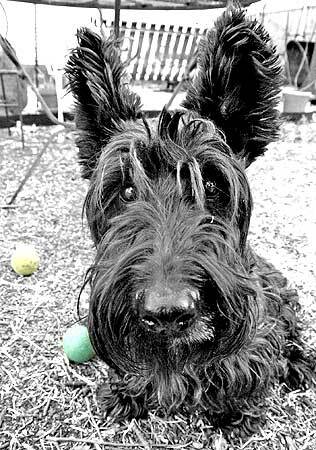 Support North Texas Scottie Rescue.